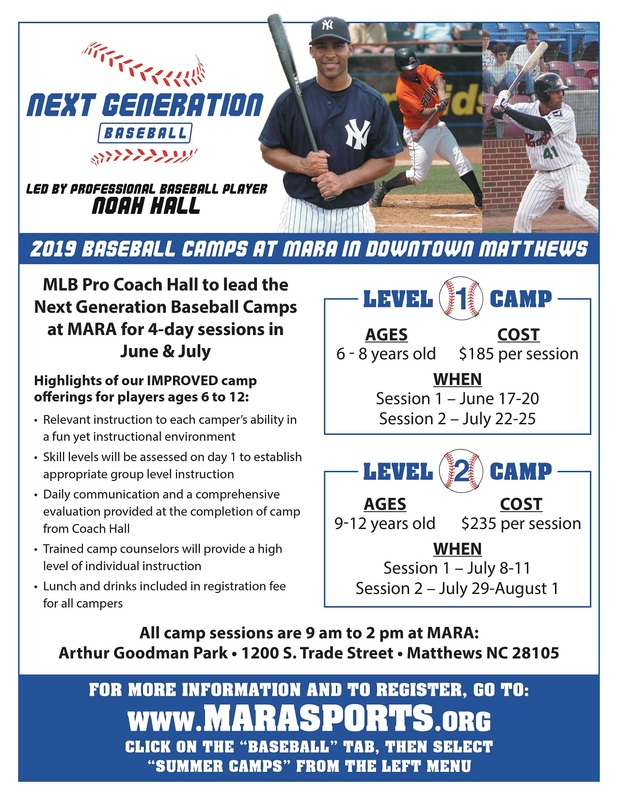 Matthews Athletic and Recreation Association was founded in 1956 for the purpose of providing the youth in Matthews/Mecklenburg County area an organized association for sports and recreational activities. Baseball has been the cornerstone of the program and is entering it's 61st year in operation. Located at Arthur Goodman Park MARA provides a balance of strong leadership, an involved community and top instruction. For player's age 4-16 MARA provides training on fundamentals as well as advanced techniques to increase each child's awareness to fitness, strategy and character. MARA Baseball have long traditions of winning at every level of play. Advanced programs are being offered that will provide players an opportunity to play challenge/travel baseball. In addition to the regular recreational season. MARA will offer a separate schedule of games against other associations. Arthur Goodman Park is located at 1200 South Trade Street in Matthews and is accessible to many families in Mecklenburg and Union Counties. Established by the Goodman family, MARA has grown to be one of the premier facilities in the area. With 10 lighted fields and multiple practice areas, teams and individuals have increased access for practice and games. MARA is the place to play. MARA – Matthews Athletic & Recreation Association has a “golden ticket” to Cooperstown Dream Parks. Our week of play is typically the last week in July (July 20 – July 26 for 2019). Baseball hall of fame week-end is July 19 – 22 for 2019 with the induction ceremony on Sunday, July 21st. We will hold an information session for parents and players (ages 11 and 12) on Friday, November 2nd at 7:00 PM in the new boardroom at MARA.